After many of you supported the first petition I shared with you a few weeks ago, I thought, why not post another one? This week I want to tell you about the campaign ‚Cruelty Free International‘. It’s aim is to ban animal testing on cosmetic products all around the globe. The EU and some other countries like Israel, Croatia or Norway have already forbidden animal testing, but it is still legal in over 80 % of the world, including the USA and Asia. On top of that, animal tested products are available for sale in every single country, EU or not. For this cause The Body Shop has teamed up with Cruelty Free International to form a petition. That’s actually how I came across it, the saleswoman at the Body Shop asked me to sign it. 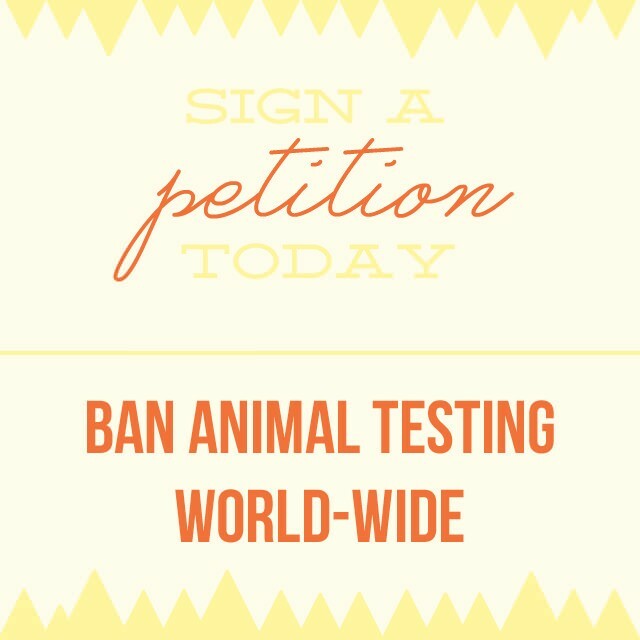 The pledge is to call on governments to ban animal testing worldwide. According to the Cruelty Free International Site the main reason for animal testing is that new products have to be tested to see if they are safe for humans to use or not. Nevertheless, it is actually safer to rely on ingredient combinations that have already been proven to be healthy for the human body. Using pretested substances would then mean animals don’t have to suffer any longer. This option shows how unnecessary animalmtesting is today. What do you think? Are you going to sign? For more information you can go here.